Hey there! ARCOTEL Donauzentrum is the new meet up place for #businessrocker and #shoppingqueens.In the middle of the 22nd district ARCOTEL Donauzentrum offers you cool meeting rooms, 158 rooms and a modern co-working space with terrace. 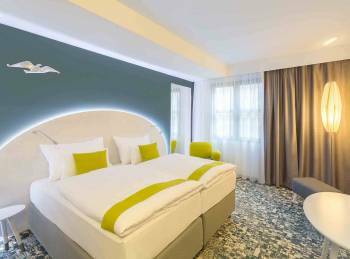 Smart room features, free Wi-Fi and digital self-check-in await all the #businessrockers.You have to run in the morning? A Grab & Go breakfast provides you a good start! A party, a meeting, congress, product presentation, photo shoot or seminar – there are so many different kinds of events. We’ve got the right space for all of them.Five seminar rooms with up to 132 m² of space offer enough room for up to 99 people. Large projection surfaces and modern conferencing technology deliver the perfect conditions for your event. High-speed WiFi is inclusive – for us, that goes without saying.Large glass fronts and modern fixtures create an atmosphere of comfort. Thanks to the individually adjustable air conditioning, you can set the room climate to your personal wishes and needs. To clear your head during breaks, our terrace offers you more than just a breath of fresh air.